There's still time to donate in support of the Region 13 convention webcast! If you wish to make a donation, just click the DONATE button to the left. And THANK YOU for your support! Congratulations to all the women and men who crossed the stage! In 1969 these seven amazing women joined Sweet Adelines International, and we honor them for their contributions over the years! KAREN BYINGTON: Karen joined Lewis and Clark Chorus in 1969. The Chorus later changed its name to Inland Harmony in the 1990s. She was a director for 25 years, and sang lead and baritone. Karen has been a member of the same chorus for 50 years! 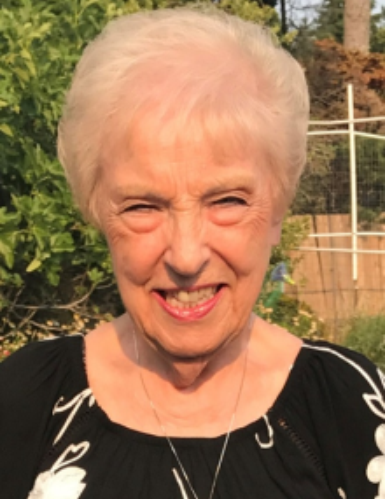 HARRIET GOGLIN: Harriet says, "It has been a joy to have learned and grown with the changes and development of our musical style over the years. Serving on many committees and activities including 40 years of costume designing has been a real pleasure!" NANCY KURTH: Nancy started her Sweet Adeline experience as a member of the St Joseph Chorus in St Joseph, MO in January of 1969. The last 21 years of her membership have been in Oregon where she has served in Leadership roles at Chorus and Regional levels and as a Regional Faculty member. Nancy has four first place quartet medals singing both lead and baritone. She is currently the Director of Northwest Harmony Chorus, a member of Pride of Portland Chorus, and bass of Rave quartet. 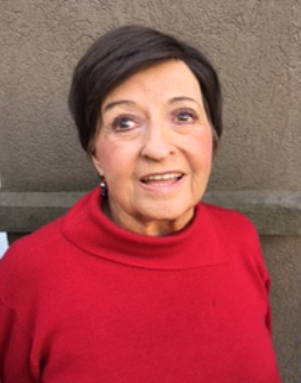 DOTTIE DEDRICK: Dottie says, "I joined Sweet Adelines in 1969 with the Greater Tacoma Chorus. I am a charter member and the immediate past team leader for Pacific Sound Chorus, one of the three choruses for which I was president/team leader. I was honored to serve nine years on the Regional Management Team. In my other life I am a retired Elementary School Principal, active in Kiwanis and the Second City Chamber Series, an organization that presents classical chamber music concerts in Tacoma." Our 2019 Heart of the Northwest Award winner is Nancy Kurth! 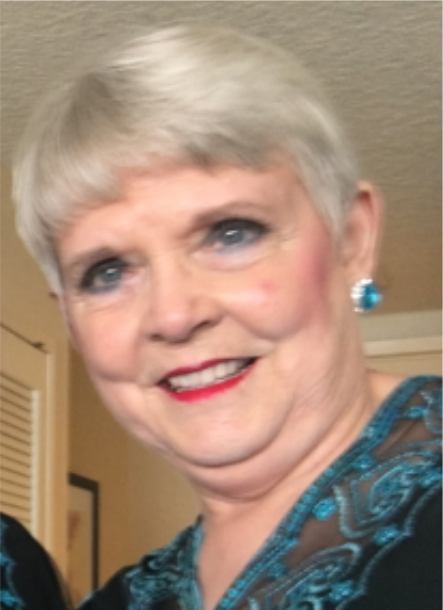 CHORUS AFFILIATION(S): Nancy is a 50-year Sweet Adeline, and currently is a member of Northwest Harmony and Pride of Portland. Her prior choruses include Willamette Sound (R24); High Country (R8); Heart of Missouri (R5), where she was their director for 5 years; Northland (R7), where she directed for 4 years; and, St. Joseph (R7), where she was Asst. Director for 8-1/2 years. CHORUS ACTIVITIES: Nancy has been Northwest Harmony's front line director for 13 years, and is currently the bass in Rave Quartet. She has been Pride of Portland's Assistant Director, Rookie Chorus Coordinator, Riser Board Coordinator, guest voice-placer, and served on the Music Staff, supervised the Music Librarian, coordinated Accountability Partners, and was the Performance Coordinator for Pride's New Zealand Tour. REGIONAL ACTIVITIES: Currently Regional Administrative Director, and will become the Education Coordinator in May, 2019. Past activities include Regional Team Coordinator, Regional Director Coordinator, R13 Faculty, Chorus and Quartet Coach, Ovation member, Co-Dean of Harmony College Northwest, and Co-Chair and Faculty for Section Leader Training Workshop 2017 - 2019. In prior Regions 5, 7, 8, and 24, she served as Regent, DMA, MDR, Treasurer, Regional Education Coordinator, and Membership and Marketing Coordinator. She has been selected “Sweet Adeline of the Year” in four of her choruses, and received R24's Rose Achievement Award. Nancy has also competed in several quartets during her 50 years with SAI, and has the medals to prove it! INTERNATIONAL ACTIVITIES: International Liaison for Young Singers Foundation Regional Liaisons, and Chair of the YSF breakfast at International Convention. Delegate to International Visionary Retreat 2018, tasked with envisioning the future of Sweet Adelines International. NOMINEE’S QUALIFICATIONS: “Generous” describes Nancy Kurth: generous with her time, her talent, and her spirit of encouragement. She nurtures new quartets, supports young singers, and cheerfully nudges seasoned singers toward excellence, never making anyone feel small or inadequate. 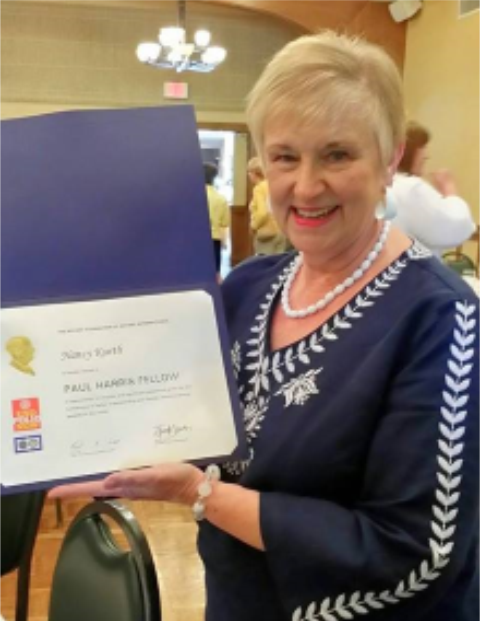 Nancy exemplifies all that is Sweet Adelines, not only by being a long-time chorus member, but also in the ways she contributes to the organization on all levels. Nancy constantly seeks ways to encourage, educate, and nurture sisters in song of all ages as she welcomes them to the barbershop art form. Nancy is always ready to share the love of our craft with everyone she meets on the local, regional, and international level. As evidenced by her long list of positions in which she has enthusiastically served over the years, Nancy exhibits strong leadership and people skills, and she shares the joy that is barbershop a cappella singing in positive, highly-energetic, and organized ways. She exhibits a boundless sense of humor as evidenced by her constant beaming smile and hearty laugh...she isn’t afraid to get silly with her sisters in song! Nancy’s thirst for ever-expanding knowledge and growth in all things barbershop extends to her own continuing education at regional and international levels. She strives to be the best singer, director, educator, team member, and “sister” that she can be. 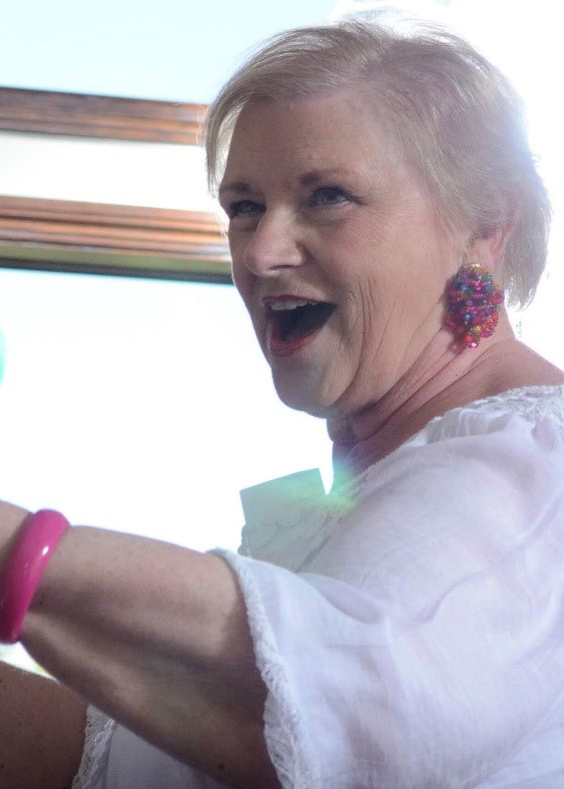 She IS “Sweet Adelines” and is willing to share this glorious art form with anyone lucky enough to meet her, often volunteering her time without expectation of recognition. She willingly shares her passion with all ages. Nancy is incredibly skilled and musically gifted,and endlessly patient with us "lesser mortals." Nancy’s dedication to the Young Women in Harmony (YWIH) and the Young Singers Foundation (YSF) is commendable and beyond measure. She has led the way in unifying the choruses in (former) Region 24 and now Region 13 by organizing the annual “In the Can” fundraiser for the YSF. The friendly rivalry between Northwest Harmony and Pride of Portland choruses for this annual fundraiser challenges all others in the region to meet their generosity in support of upcoming musicians. She has helped organize Young Women in Harmony promotions in the Pride of Portland Chorus and Girl Scout events in Northwest Harmony Chorus. Nancy and the members of Northwest Harmony Chorus welcome singers of all ages in an annual “Holiday Chorus” which provides hours of community outreach performances during the winter holiday season. Singers of all ages participate in the holiday chorus with no experience necessary; it's a great introduction to barbershop and the sisterhood of Sweet Adelines. Nancy has contributed her heart and soul to our organization for 50 years! She is loved by many in our region and beyond -- especially by her chorus sisters in Northwest Harmony and Pride of Portland Choruses. Nancy exemplifies “I Am Sweet Adelines” with every fiber of her being, and is truly deserving of the Heart of the Northwest Award. OTHER 2019 HEART OF THE NORTHWEST NOMINEES WERE: Jerry Beyrodt, Nikki Blackmer, Candace Johnson, Arlene Kintz, and Charlene O'Connor. Congratulations to all!